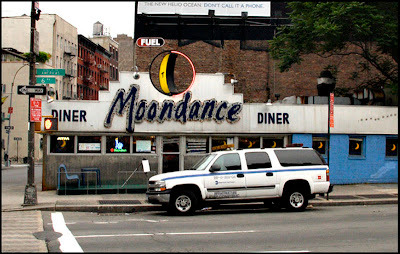 If you're on Sixth Avenue near Canal Street, and you have a hankering for pancakes, I suggest you head up to Grand Street and stop in at the Moondance Diner. 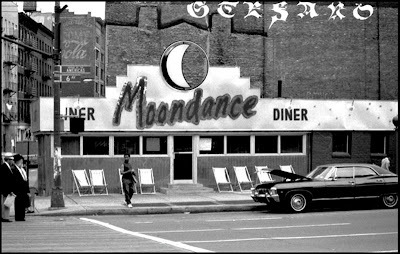 I'm not sure when it opened, (the NYC building department shows a structure here since 1972) but it was the Moondance when I first saw it, and remains so to this day. They had good food back then, and, though I didn't stop in this time, I remember fabulous pancakes, and coffee with a touch of cinnamon. I also figure if the cops are eating there it must still be good. Although, as we'll see very soon, and very surprisingly, change often occurs quite rapidly. Nah, the pancakes just haven't been the same since they straightened out the "oondance."